Lightly spray a pan with oil and add vegetables, add salt pepper and herbs for flavor and grill for 5 minutes. 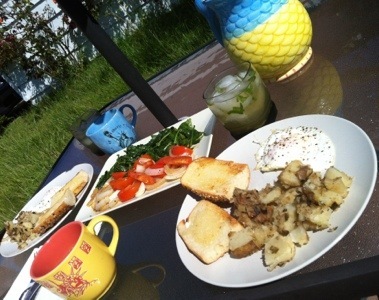 Serve along with eggs, bread and potatoes for a full on Sunday Brunch! I love swiss chard. I cook it very simply sometimes, so this will be an easy recipe. Add the garlic and butter to a wok or a large frying pan. 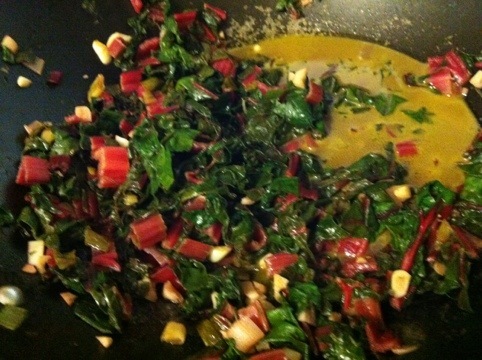 Once that has cooked for a couple minutes, add the water to create a sauce to sauté the swiss chard in. 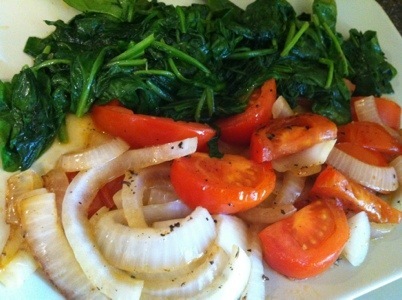 Add swiss chard and cook for 5 minutes or until wilted and cooked. I love sautéed kale and prepare it different ways. This is really easy. Heat a pan to Medium heat and add olive oil and garlic. 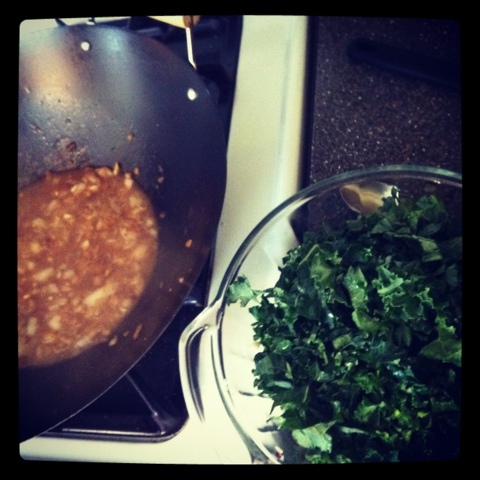 Sautee for a minute or two before adding water and then kale. Cooking time depends on preference, I cook mine for about 5 minutes. Plate and then add shredded parmesan to the top before serving. 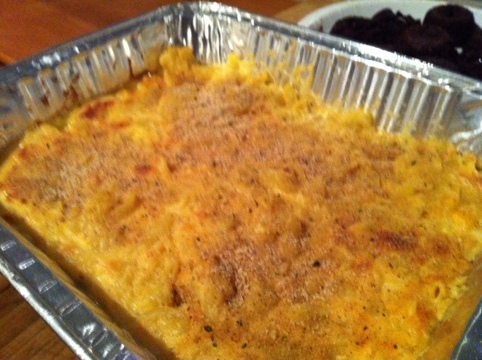 I made a couple Macaroni and Cheese dishes for my friend Cooter’s Birthday party. 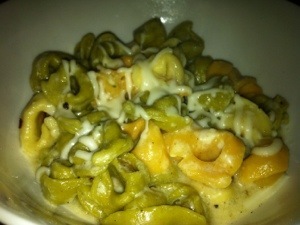 This is a recipe for the Basic Creamy Macaroni and Cheese. 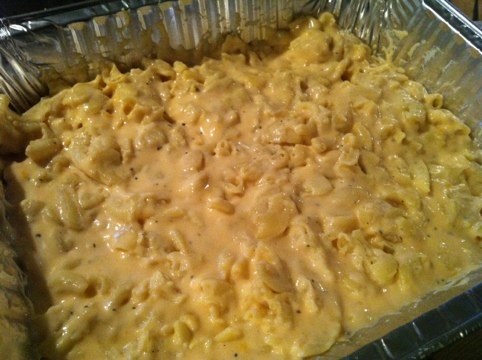 Boil the Macaroni until done and place aside in a baking pan. In a sauce pan, heat butter, milk and cream cheese with salt and pepper. Once that is heated, add cheddar cheese and continue to stir constantly over a medium heat making sure not to burn the cheese. Add seasoning – salt and pepper, maybe cayenne and Italian herbs if desired and then last the flour. Remove the cheese from the heat and pour over the macaroni in the baking dish. Cover with bread crumbs and put into the oven for 15-20 minutes at 350 or until golden. I like to balance my meals with fresh side dishes, so when I had my New Year’s Eve crab, I served it with a Stir Fried Baby Boy Choy with tomatoes and onions. Easy and light enough to balance the meal. It’s also very colorfuland brightens up your plate. Heat butter and saute onions, add soy sauce and water. 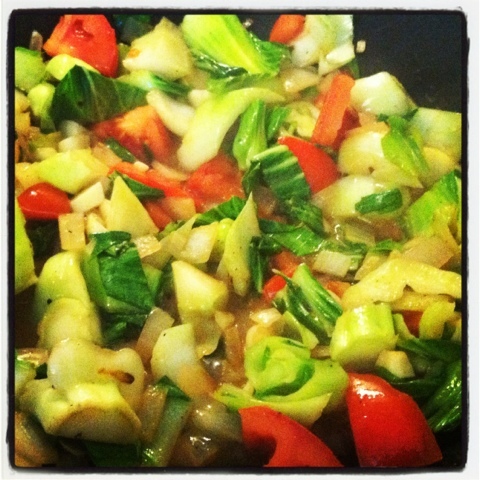 Add pepper flakes, then diced Boy Choy and saute another 2 minutes. Then add tomatoes. Cook until vegetables are still crisp, yet cooked thoroughly. 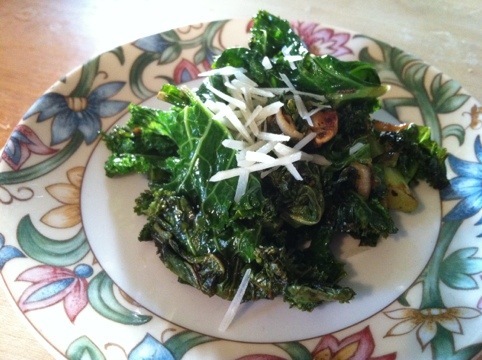 My other New Year’s Appetizer!I went to a restaurant in Alameda called Pappo and was served Kale Stuffed Mushrooms. This sparked an idea. I would make these mushrooms using Baby Bellas (Portabella Mushrooms) and make some with bacon. They were amazing! Although the photos don’t do much justice, you will have to take my word or take a chance! For the Vegetarian Version, skip the bacon step or substitute with soyrizo. 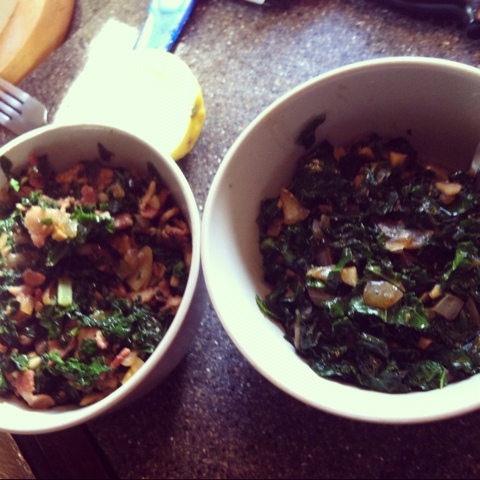 1 head of Kale (I split this in two to make veggie ones and bacon ones), chopped small. 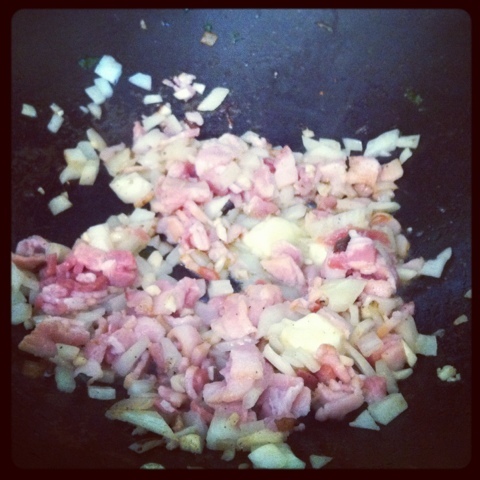 In a large frying pan or skillet, warm the oil or butter then add your garlic and onion, add chopped bacon (smaller the better), let saute and add soy sauce then water. Let that cook a bit then add the chopped kale and saute until cooked thoroughly. Remove from heat and drain a little if needed. I purchased two large baskets of Baby Bella Mushrooms, cut off the stems and hollowed them if needed. I lined a pan with foil and placed the mushrooms on, drizzled them in olive oil. 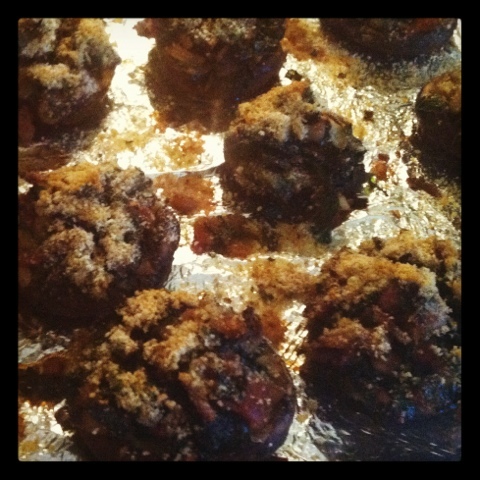 Then I scooped the kale into the mushroom filling them completely. Sprinkle bread crumbs on top. Bake for 20 minutes or so at 350 Degrees, until the mushrooms are cooked and slightly golden brown on top.